While I was at my mother’s she mentioned that she had a whole lot of slides she didn’t know what to do with. We had a good time one day looking at all them with a little hand-held viewer that used to belong to my grandfather and that I’ve hung onto for years. I was thrilled to see some photos I’ve been looking for for ages. When I was about twelve or thirteen, my grandfather gave me his old rangefinder camera. Few people these days are familiar with rangefinders. They are a mirrorless camera usually designed for thirty-five millimeter film. It looks like a single lens reflex camera but it’s not quite as heavy. It was completely manual. Cameras with auto-focus lenses were only just beginning to be produced for the general public at that time and I didn’t know anyone who had them and wouldn’t for a number of years yet. In a rangefinder, you don’t see directly through the lens. Like in the old 110 or 126 film formats, the image you see is slightly above and to the left of the image that will be exposed to the film. For shots that are far away, if barely matters, but for close-up shots it’s good to bear that in mind. In the center of the viewfinder, you see a double image, and when the image is united it is in focus. They’re considered more difficult to use than an SLR, but some years later I would buy a manual focus Nikon SLR when the film advance stopped working and I didn’t find it easier to use at all. The old camera was made by a company I’d never heard of, Aries, but it took beautiful pictures. She took the slides to a photo store and was told that it would cost five dollars each to scan them. I found some less expensive places online, but that involved sending them off somewhere. So I got the idea in my head to buy a little film-to-digital converter. Since I have slides of my own, I figured this would be useful. I’m ambivalent about the purchase. I find the quality of the scanned images to be quite low. This might not be much of a problem for some “snapshots,” but it’s a little disappointing for some of my juvenile photography efforts. I believe Andy Warhol said, “My idea of a perfect photo is one that is in focus and of a famous person.” I think it might be hard for people today to realize that prior to auto-focus systems developing the skill of getting things in focus and getting the exposure correct was more of a challenge than it would become. So the low quality of the scanning is a little disappointing for me. For my early efforts my poor sister was often pressed into service as the subject matter. Pretend she’s someone famous. I can tell this is one of my “artistic” efforts by the low vantage point. So seventies! 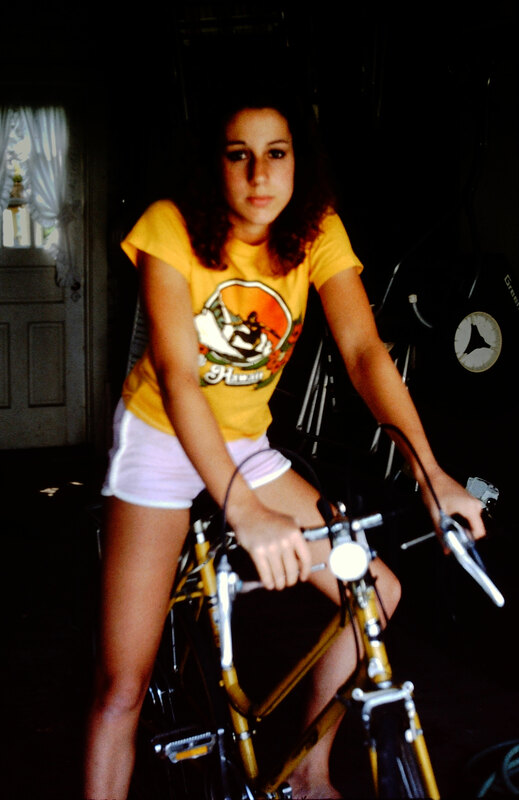 She bought this t-shirt in 1979. Those shorts, by the way, are terry cloth. That was a thing back then, a thing I nearly forgot. Yes, the brief fad of terry cloth jogging shorts. Terry cloth shorts! Bet they were comfy though… 🙂 Your sister seems to glow with a light of her own! The were comfortable, but they didn’t wear well. They were good over a bathing suit. My sister is a really sweet person. She used to call herself the “bully of the bullies” because she would stop the tough kids from picking on the vulnerable kids.